A series of studies by one research group in Oregon reported that, on average, children move one full level down the autism spectrum after 20 weeks of Qigong Sensory Training (QST) — a type of massage therapy adapted from Traditional Chinese Medicine. UNC postdoc Kristin Jerger found these results so intriguing that she has published a feasibility study for a new line of research on the neural mechanisms of QST massage. Kristin Jerger massages a child's hand using a technique called Qigong Sensory Training. Kristin Jerger closes her eyes and draws several slow, deliberate breaths — out, in, out, in — and begins her demonstration of QST massage. Her soft breathing is the only sound in the research space: a small but comfortable room with warm lighting and a cushioned massage table in the center. At first glance it seems more like a room in a home or hotel, but closer inspection reveals the discreetly-positioned video camera and cables for collecting non-invasive biological data that run through the wall to the control room of the Biobehavioral Lab in UNC’s School of Nursing, a shared research facility. Jerger walks around the table, slowly lifting and lowering her hands to warm up as she does prior to all her massage sessions. A few minutes later, Jerger stands on one side of a young boy, lying stiffly on his stomach, hands at his side. The child’s mother stands on the other side of the table. QST massage is actually parent-delivered on a daily basis — with weekly therapist support for the first 20 weeks — so parents are closely involved in all clinical and research sessions. Jerger begins by patting the child firmly on the crown of his head, which the child pushes into her hand, and she continues the patting movement down his spine and back of legs to his heel before repeating this movement two more times. There are twelve movements in the QST massage. Each follows one of the meridians used in acupuncture. The touch is firm, direct, and produces a sort of dull vibration in its aftermath. Throughout the 20-minute session, the boy’s body becomes less stiff, and he appears to relax. Massage is not new; archaeologists believe that the practice is as old as some of the world’s earliest and most influential civilizations. Today, it’s hard to walk through a mall or airport without seeing some form of massage marketed for stress relief. So what’s new about QST massage? QST massage was designed specifically as a medical treatment for children with autism. Jerger hopes that learning how this method improves symptoms of autism will not only be helpful in placing QST massage alongside current treatments for the disorder, but will also help other researchers better grasp autism itself. “UNC has such outstanding researchers working on different pieces of this puzzle — it’s just an honor to support the community by contributing a small piece,” Jerger says. In a dimly lit office tucked away in the UNC School of Medicine, Jerger drinks a cup of green tea as she discusses her research. She is in her final year as a postdoctoral fellow in the Department of Physical Medicine and Rehabilitation’s Program for Integrative Medicine, and her research focuses on using massage therapy to augment the treatment of children diagnosed with autism. The families of people with autism and autism researchers sometimes feel like they’re trying to complete a puzzle they can’t fully see just yet. But little by little, the pieces explaining behaviors of people with autism are coming together — and abnormal sensory experiences seem to be at the heart of many of them. In 2013, abnormal sensory processing was included as part of the diagnosis of Autism Spectrum Disorder for the first time. Now, sensory dysregulation — experiencing stimulation either more or less than most people — is recognized as an integral part of autism, which may underlie many of the disorder’s core symptoms. Here’s one way this could happen: The sense of touch begins to develop before birth. If touch is uncomfortable, it is likely to have downstream effects on behaviors developed later in life such as social interaction. If it hurts when someone holds a child’s hand, for instance, the child will pull it away. The person who held their hand may see this behavior as a rejection and react accordingly, even though that action wasn’t meant to be personal — the child was simply responding to physical discomfort in the way any person would respond. Many children with autism are sensitive to touch. QST massage helps normalize this sensitivity. In that scenario, the core of the abnormal social interaction is the child’s atypical sense of touch, not their sense of social norms. If it didn’t hurt, they wouldn’t have pulled their hand away, and the interaction would likely have proceeded normally. This is the idea behind QST massage: to normalize the sense of touch through daily parent-delivered treatments so that subsequent development can proceed in the magical way it normally does. Jerger and a team of researchers at UNC recently tested the feasibility of conducting a full-scale study to investigate the effects of QST on children with autism between the ages of 4 and 7. Twenty children viewed pictures of faces expressing certain emotions both before and after QST massage, while researchers recorded their heart rate and brain oxygenation. The results were exciting: Only one of the twenty children was unable to complete the study, suggesting a larger study is feasible. In addition, the team gathered some intriguing data they will use to formulate plausible hypotheses for the next study. In particular, processing of emotional stimuli elicited different responses by the brain and heart after children received QST massage, compared to before the massage and other children with autism who watched a video instead of receiving the massage. These data suggest that QST massage may affect activity of the prefrontal cortex, the part of the brain in charge of complex cognitive functions like social behaviors, as well as the autonomic nervous system, which regulates important functions like digestion and sleep. In children with autism, these important behaviors and body functions often present abnormal — and were improved after 20 weeks of QST massage in studies by Louisa Silva, a leader in interventions for children with autism and other developmental disorders. Silva worked with a Traditional Chinese Medicine doctor craft QST massage. Additionally, these biological measurements coincided with behaviors observed on videos of the children. Prior to the treatment, they showed little to no response to expressions. But after the massage, their responses were much more visceral — many reacted with unease to sad and angry faces or even started to vocalize and cry. The best part of QST massage? It’s inexpensive to learn, extremely teachable, and accessible to parents of both verbal and non-verbal children with autism. 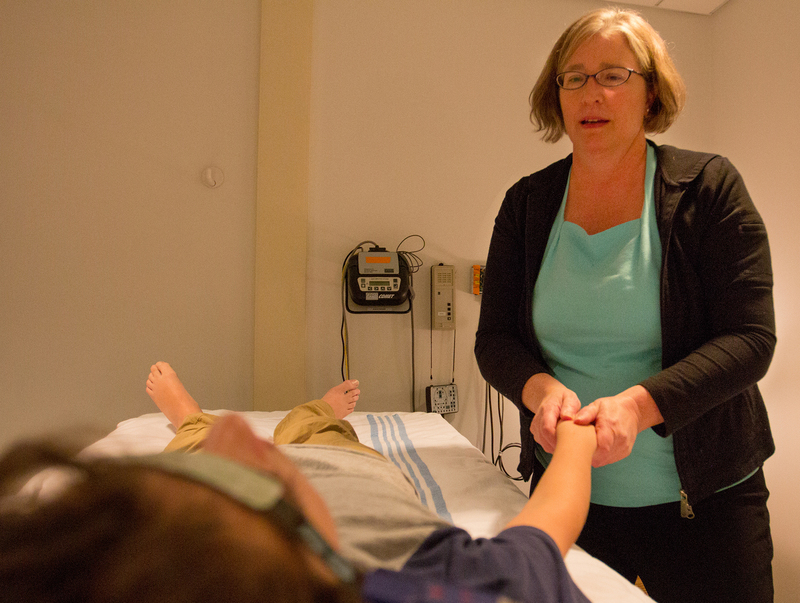 “QST massage doesn’t require anything but the parents’ hands,” Jerger says. “The parents do the massage with a certified QST therapist once a week for 20 weeks, and do quite well on their own after. You might say they ‘own’ the massage.” In fact, a 2016 study from Silva reported that two years after working with a therapist, those children whose parents continued the massage continued to progress. What about risks? “To date, no serious adverse reactions have been reported,” Jerger says. Going forward, Jerger hopes to see other researchers repeat Silva’s studies. This will guarantee replicable results that Jerger and her team can use to follow up on their feasibility study and learn more about how the method is working. Kristin Jerger is a physician and licensed massage therapist currently working as a Postdoctoral Research Fellow in UNC-Chapel Hill’s Program in Integrative Medicine within the Department of Physical Medicine and Rehabilitation.